Fight Club Custom is a Cerakote trained as certified Cerakote Applicator. Our coating service are available for TW and various platforms. CerakoteTM advanced ceramic firearms coatings, are the finest on the market today and outperform all other coatings in virtually every performance metric. These coatings have been extensively tested by manufacturers, independent labs and the U.S. Military. CerakoteTM is used by OEM’s such as SIG Sauer, FN, Colt, S&W, Nighthawk Custom, Thompson Center, Nosler, Benchmade, Emerson and a growing list of others. CerakoteTM ceramic coatings can be used to coat a wide range of substrates including all metals, including titanium, aluminum, magnesium, etc, as well as most plastics and polymers used in firearms frames, stocks and high-quality accessories. We provide custom coating service for complete TW rifles and various systems and parts made of metal, plastics and polymers (Cerakote cannot be applied on rubber). Please contact us sales@ptwcustom.com for more details and pricing. 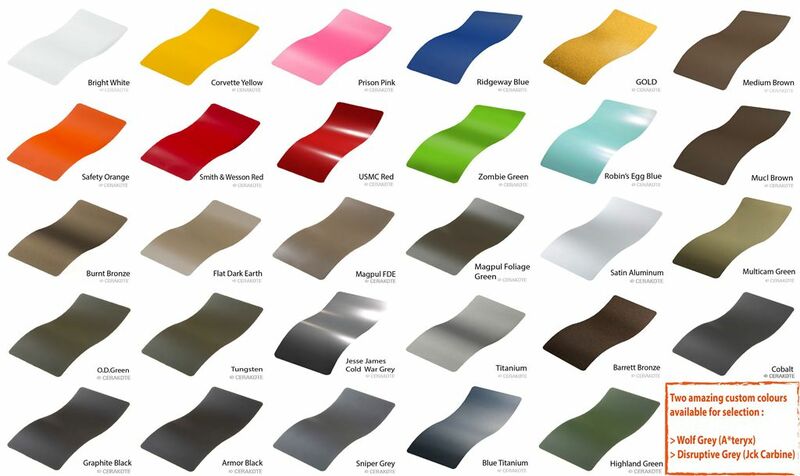 Warning: Cerakote is a permanent coating, once cured and set, it may not be removed by solvent.